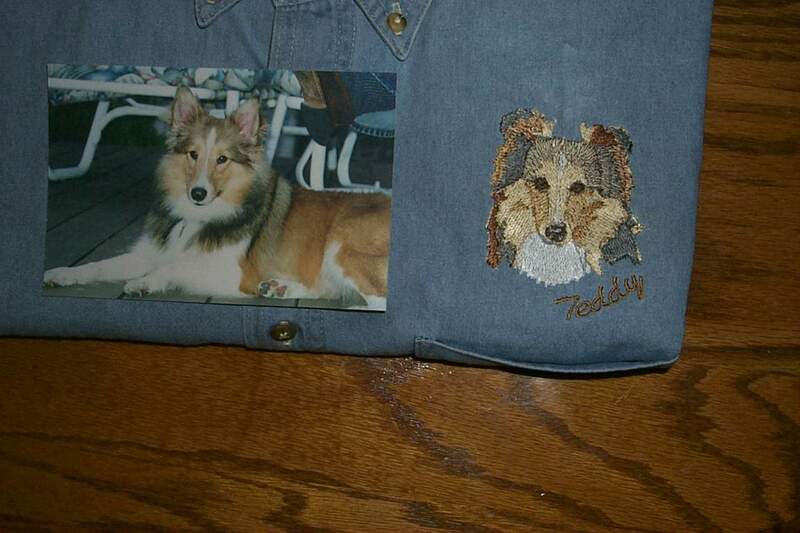 We specialize in embroidery of dog designs on apparel. We have over 300 designs to choose from and we are continually adding to our collection. All designs can be custom designed to resemble your pet. They can be personalize with your pets name or if you prefer their breed. Most of our designs are of dogs but be do have a few cats and horses. We have a variety of sweatshirts, denim shirts, and totes. Or visit our full line catalog for additional apparel and contact us for a quote. Choose from portraits or full body designs (full body designs are not yet available for viewing online, please email us for more information). Colors can be also be changed. The size of the designs for the shirts are approximately 2.5 X 2.5 inches. Designs on hats are relatively smaller. Placement of the design is on left chest or center. Pet stores, groomers, breeders, dog clubs and organizations are welcome to inquire about quantity discount ordering. Pictured on the left is a photograph of a Shelty. To the right is the embroidered design which is also personalized with the customers pet's name.